Hydraulic cylinders are used to apply controlled force for pushing (pressing), pulling, lifting, bending or clamping by means of oil pressure. The force generated by a hydraulic pump is transferred to other tools and equipment by a cylinder. Because hydraulic cylinders can be used for such a wide range of different applications, there are many types of cylinders with various capacities; lifting heavy loads requires a different type of cylinder than the ones used in a production process, which repeatedly requires fast push or pull motions. Laco is a specialised supplier of hydraulic tools and accessories and hires or sells the right hydraulic cylinder for each possible application. When choosing a hydraulic cylinder, it is important that you know the exact capacity requirements of your application and the desired length of stroke. The combination with the right pump and system components is at least as important. That is why you should contact Laco before purchasing or hiring a hydraulic cylinder. There you will find advisors, who will help you select the cylinders and pumps that best fit your needs. Laco will not only provide you with the right tool, but also with professional advice and support. WHICH TYPES OF HYDRAULIC CYLINDERS CAN YOU FIND AT LACO? 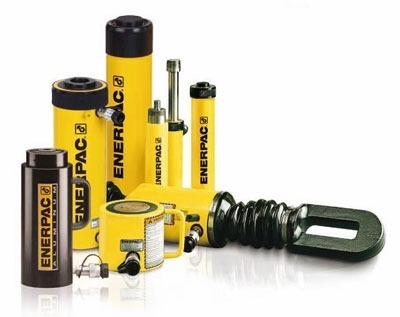 Single-acting cylinders (Enerpac, Holmatro, Rehobot ) – The most universal hydraulic cylinders with spring or gravity return, lock nut cylinders, telescopic cylinders, hollow plunger cylinders, short stroke cylinders and construction cylinders. The capacities of single-acting cylinders strongly vary, from 5 to 100 ton for the most common cylinders up to 1000 ton for the heavy-duty lifting cylinders. Single-acting cylinders are used for many building and industrial applications, for maintenance and manufacturing. Double-acting cylinders (Enerpac, Holmatro, Rehobot) – The most important difference between a single- and double-acting cylinder is the larger capacity (50 to 1000 ton) and length of stroke and the fact that double-acting cylinders can both push and pull. The piston of double-acting cylinders returns to its original positions by means of a hydraulic or air return. The industrial applications are similar to those of single-acting cylinders.